I find the aromas and taste of the spices used in Middle Eastern food irresistible - so warm and inviting. And with such seductive spices, it’s easy to cook food full of flavour. To me, this Lebanese-style lamb dish is comfort food. Unlike Western-style comfort food - which usually contains a lot of butter and cream – this is lighter and healthier food. 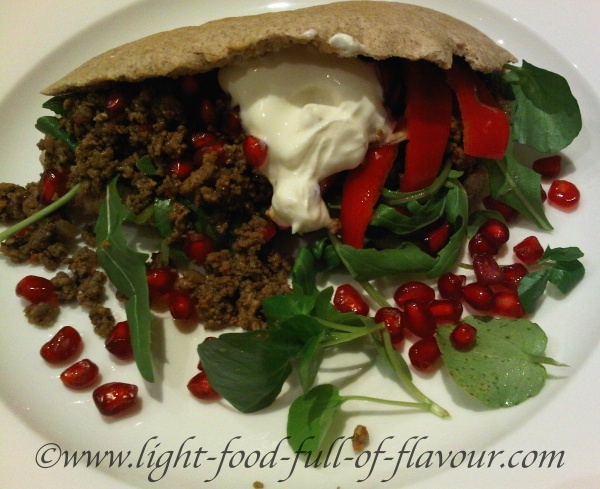 There is no denying that the lamb meat has quite a high fat content – I use lean lamb mince for this recipe. A good way to reduce the calories of any meal is to up the intake of the vegetables served. This makes for a relaxed meal where everyone adds as many things as they want to their own pitta bread. 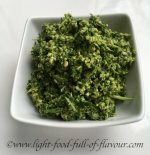 For the lettuce, choose watercress and/or rocket leaves – both are properly peppery but the most nutritious one is the watercress, a nutritional goldmine (see Nutritional Information). At the opposite end is iceberg lettuce, found in so many ready-made salads, which contain about 99%water and near 0% nutrients. It is the darker green lettuce leaves which are the most nutritious. 1. Heat the oil in a heavy based pan and cook the onion over a medium heat for 5 minutes. Add the garlic and cook for a further minute, then add the lamb mince. Stir to break up the mince and continue to cook until the mince is brown all over. 2. Add the spices, chilli, tomato purée and water to the pan. Season the mince mixture with salt and pepper and stir. Cook over a low-medium heat for 20 minutes – stirring every now and then – until all the liquid has evaporated. Check the seasoning. Toast the pitta bread and place all the extra things to add to the pitta bread in separate bowls along with the hot Lebanese-style lamb mix.